Black 5.25” DeskTop External Enclosure IDE to USB 2.0 / 1.1 for CD’RW / DVD’RW. Teac CD-RW CD-Rewritable 32x 4x CD-W54E IDE. Tested & Working. 24X24X24X8 DVD-ROM/CDRW. 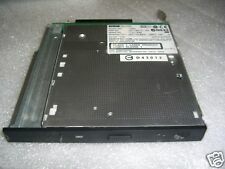 DISK DRIVE; OPTICAL,CD-RW/DVD ROM OR COMBO, SATA. Laptop Drive. Part # DW-224S-V93. Black 5.25” DeskTop External Enclosure IDE / PATA to USB 2.0 / 1.1 for CD’RW / DVD’RW Drive. One USB 2.0 / 1.1 Enclosure / Case for IDE / PATA Optical Drives. One USB Cable. THE ONE YOU WILL GET IS SIMILAR IN CONDITION. ONLY THE ITEM PICTURED IS INCLUDED. IF IT IS NOT PICTURED, IT IS NOT INCLUDED. WE MAY HAVE MULTIPLE UNITS AVAILABLE, SEE ABOVE. Teac DV-W524GSB 16x DVD±RW DL SATA Drive. 16x maximum read speed (DVD). 16x maximum write speed (DVD±R). Teac DV-W524GSB 16x DVD /-RW DL Internal SATA Burner Drive. 8x maximum rewrite speed (DVD RW). SATA interface. Class1 lasser product. TEAC DV-28S-VV3 DVD Drive. V JB 1977192V-V3. The Door is always open. and We'll leave the light on for Ya! Teac Club Mac 24/10/40 External FireWire CD-RW Drive. D 5 ( 40. ) 2018-09-18. Looks great! d 1 ( 40. ) 2018-09-21. ) 2018-09-19. g s ( 1274. c r ( 904. ). These were pulled from systems and are in excellent condition as they have been sitting in our warehouse for over 20 years. We have many units available. This listing is for 1 unit only. No other cords included just the hard drives. Fits General Dynamics Itronix Models GD8000 or GD8200. TEAC CDRW DVDRW Slot Loading Optical Drive. Part # 1977214R-93. GD Part # 70 250047 00. TEAC 16X DVD-ROM Drive. TEAC PART # DV516E/KIT/B. 5.25" Internal Black. NEW IN FACTORY SEALED BOX. IN THE LOWER 48 STATES OF U.S.A. The attached photos are of one of. (ITEM # 01579). This item is. Current Consumtion Standby/Sleep: 50mA (Avarage current max.). The maximum wet-bulb is 29.4°C. RoHS Directive Complied. Weight 170g or less. Safety Standards Approved by UL, CUL, TÜV, CE and BSMI. MTBF 60.000POH (10% duty). Unless otherwise stated, this has been tested for key functionality. This has been tested and it is in good working order. Note that any other parts or accessories are NOT included. See pictures for further details. Teac DV-W28E-R93 1977202R-93 Internal IDE DVDRW Multi Recorder. Teac DV-18SA DVD-ROM SATA. We reserve the right to accept or decline your order. Burner Optical Drive PLD-DU-8D1S(B). Various products may have "Extended Manufacturer's Warranty". Part Number: PLD-DU-8D1S(B). Drive Specifications Part No 1977098A-93. This is a tested working, used, clean, Teac 8x/24x DVD-ROM/CD-ROM Slim SATA Optical Drive. Teac Part #:1977233W-Z3. Teac Model #:DV-28S-W.
Max DVD Read Speed 8x. Drive Interface SATA. Certificate/Authority RoHS. Form Factor Internal. Type DVD-Rom Drive. Maximum CD Read Speed 24x. Green Compliant Yes. 132FK 24X CDROM. SLIM SFF DRIVE. INTERNAL LAPTOP CD ROM DRIVE. TEAC CD-552E-A94 / 1977100A-94 52X IDE INTERNAL 5.25" CD-ROM DRIVE - 1977100A94. Buffer Size. CD Extra, CD-DA (audio), CD-I, CD-ROM, CD-ROM XA, I-Trax, Photo CD, Video CD. Drive Type. CD-ROM drive. One used Teac IDE internal CD ROM drive, Model: CD-224E. This is for a used tested working, TEAC DVD Writer IDE Slot Load with eject push button. The Teac label is incorrect. The actual model is identified as: "DV-W28SLC", with firmware version: S.0C. This Teac DV-W524GS-100 is a multi-format DVD and CD-RW burner that allows you to create movies, music CDs, photos, and even backup files! It writes to DVD R at 24x, writes to DVD-R at 8x, and rewrites to DVD RW at 8x and rewrites to DVD-RW at 6x. 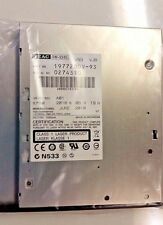 TEAC CD-W524E 24X 10X 40X IDE / PATA Internal 5.25" CD'R/RW DRIVE - CDW524E - 19770860-34 - 1977086034. 40x speed reading for CD-ROM disc. Disc Rotation Speed 8,562min-1(rpm) Approx. ( 40X CAV speed mode ). THIS AUCTION IS FOR A BRAND NEW TEAC # FD-235HF 193077C291 FLOPPY DRIVE. GOOD LUCK BIDDING. Teac DV-W28E C-093 19771760-93 Dual layer DVD RW. DOES NOT INCLUDE IDE CABLE, MANUALS, CD DISK, OR SCREWS. (1) SATA Slim-line Optical DVD Drive, (1) 880mm SATA cable. Note: A peripheral power cable is included with the systems that have support for optical drives. (Optical drives are not supported in R2312WT & R2224WT based systems). COMPATIBLE MODELS: Dell Vostro 1320 1520 1720 INSPIRON N7110 laptop. SATA Support System. 8X DVD-ROM Reading DVD MULTI Read. Drive Specification.